The 2017 HFNA annual meeting was held on Monday, April 24, at Huntingtowne Farms Elementary School. Officer Smith from the Charlotte Mecklenburg Police Department reported that our neighborhood has seen little criminal activity so far this year. Crimes of opportunity, such as thefts from unlocked vehicles, are almost always the most common crimes in our area. Officer Smith reminded attendees of some basic safety tips: Lock your car. Don’t leave valuables in your car. If you’re away from home, make it look like someone is there (leave lights on timers, have someone get your mail, etc.). Officer Smith also addressed the increase in coyote sightings in our area. He noted that coyotes are not a threat to humans, but they can be a threat to small pets if they’re left outside unattended, especially at night. He strongly advised residents not to touch a wild animal due to the threat of rabies. The ONLY exception: It’s okay to put a bird that has fallen out of its nest back in the nest (it’s not true that a bird’s parents will reject a baby if a human has handled it). The county offers free rabies vaccinations for pets on the second Saturday of every month, and also offers low-cost microchipping. Visit charlottenc.gov for more details. Gwen Cook of Mecklenburg County Parks and Recreation updated meeting attendees on the progress of the Sugar Creek Greenway. The section connecting Park Road Park to Archdale Drive is almost complete. There will be a parking lot added at Tyvola Road, with a traffic light near the Marion Deal Recreation Center. Crosswalks on Archdale Drive and a bridge under the road will accommodate greenway users. These amenities are expected to be complete by next spring. Cook said the county will also be widening the pathway on our greenway segment from 10 feet to 12 feet. A map of the project can be found here. 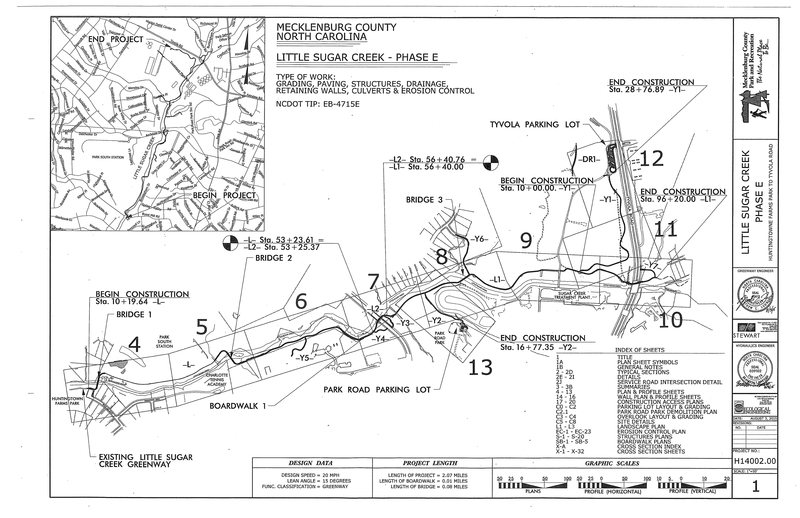 Nancy Marshall reported that there is currently no set start date for the pipe installation under Lily Mill to improve creek drainage. It will likely be after school ends, so that the work doesn’t interfere with school bus traffic. The project will take five to six months. Ashley Gilbert of the SPSTC board announced that pool memberships are still available, but the pool may need to start putting applicants on a waitlist soon. New improvements include extending the baby pool and its deck with a zero entry, bubblers, and a mushroom toy. The pool slide is also being replaced. Future plans include a bathroom remodel and new decking. Family memberships are $550 with an $800 initiation fee. Planned summer events include three movie nights. For more information visit southparkstc.com. Kim Riddle, our neighborhood school liaison (and Section 3 leader), said that the school yard sale on April 22 raised $1,000 for the HF PTA. She also said that HFES welcomes volunteers for tutoring and other activities. Please contact the school if you would like to volunteer. Wally Dawson, HFNA president, gave a treasurer’s report in the absence of Treasurer Mark Thornberry. For the first time in recent memory, HFNA brought in fewer funds (in dues payments) than we spent on expenses such as entrance maintenance and events. This was due to a drop in membership (see note below on membership). Membership. Wally emphasized the need for volunteers to help with membership recruitment and information collection. Some neighbors suggested mailing a paper membership form/invoice to all HF residents instead of relying solely on online dues payments, because some residents don’t use the internet very often or would simply prefer a paper invoice. Other attendees noted the expense of mailing an invoice to every house and wondered if the cost was worth it when many residents are willing and able to pay online. Neighborhood Watch. A neighborhood watch team is being assembled—stay tuned! New website. A revised HFNA website (HuntingtowneFarms.com) went live recently. The goal is maintain a more up-to-date and user-friendly site. Entrances. One HF resident raised the issue of needed enhancements to neighborhood entrances. Wally explained that he had gotten several bids for upgrades to the entrances, but they came in at $10,000 to $16,000, which was more than anticipated. Several alternatives were discussed, including neighbors volunteering to do the work, or collecting a one-time assessment from all (willing) neighbors to pay for the work. Fourth of July parade. This is the next event on the schedule. A volunteer is needed to organize the event, as the previous organizer moved out of the neighborhood. Fall Picnic. This is an event that requires a lot of resources and volunteers. The possibility of hosting it on the SPSTC property instead of in the park was discussed. This would make rescheduling in the event of bad weather easier, as permits with the county (needed for an event in HF Park) would not have to be revised. Board of County Commissioners. Did you know that our representative to the Mecklenburg Board of County Commissioners, Matthew Ridenhour (District 5), lives in Huntingtowne Farms? Matthew was at the meeting and encouraged neighbors with questions or concerns related to county services to call him at 704-880-4916. You can also email him at Matthew.Ridenhour @ MecklenburgCountyNC.gov. HFNA Board. We still need a few more section leaders!